The ASE Iridium 9555 Docking Station is a next generation docking station specifically designed for the Iridium 9555 satellite handset and offers RJ11 connectivy to integrate your desk phone or PBAX system. The ASE Iridium 9555 Docking Station (Part Number ASE-DK075) provides a unique solution for using your 9555 Iridium satellite phone indoors and outdoors. Just dock your Iridium phone in the docking station and you can access satellite communications with standard analog phone sets or your company's PBX system. When you need to leave the office, just un-dock your handset and take it with you. Never be out of touch again! Features and Equipment • RJ11 Connect (ASE-DK075 only) - Connects to an analog phone (single or PBX) including multihandset wireless phones. Use of a cordless phone with expandable handsets can provide up to eight units within a two-mile range (unobstructed) from the base station. • USBConnect - USB port for data connections including Internet connection with Direct Internet 2.0. • Built-In Charger - Keeps handset fully charged for immediate use when un-docked. • RealTime System Status Indicators - Large Icons allow status viewing from 25'. 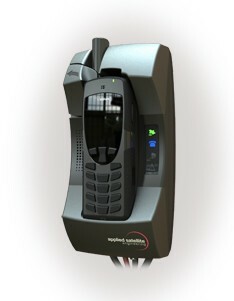 • Ergonomic 'Body-Lock' Handset Containment - Provides secure handset restraint in any environment. Advanced Features • Smart Dialing - The Docking Station knows the correct format for the country that is being dialed and places the call once the number is entered. Smart Dialing eliminates the superfluous "00" IDD code (no more international dialing sequence). • Simple Operation - The Docking Station combines clear LED status lights with the Iridium handset's graphical display for setup, troubleshooting, programming, and operation. • Base Station Ringer - Audible ringing to alert of incoming calls. • Versatile Power Input - 9 - 36 VDC input range supports power systems on most vehicles and vessels. An included universal power adapter allows 100 - 240VAC, 47 - 63 Hz operation. A DC Vehicle adapter is also included. • Antenna Options - Can be used with many antennas, including fixed-mast, mobile fixed-mount, and mobile magnetic-mount models. NOTE: this is not the official site of Iridium Satellite, if you need to visit it, Please go to www.iridium.com. These pages describes the Iridium Service offered by the service Partner AST through Geoborders Company. All prices, if it not especially written, excludes VAT, taxes, customs and delivery costs. Iridium products are intended for professional usage and Warranty is 12 months.